So next week issue 61 of Lights Go Out will be released! Starring Salad, DeadBeat At Dawn, Adorable, Mud Cake Records and The Terrorsurfs in interview action. 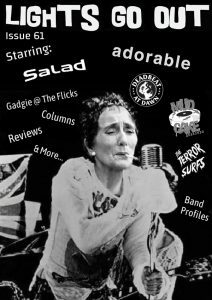 There’s also music reviews and zine reviews too along with another installment of Gadgie Fanzine @ The Flicks (this time it’s that Star Wars Holiday Special!). Band profiles from the likes of Tin Fish, Manalishi, @radioactive ape, Ventures The Clinch, This is Not a Drill, Pollen., A Cereal Killer & Artella. You can pre order it from us now!!! Ya know if you wanna and all that, thanks!